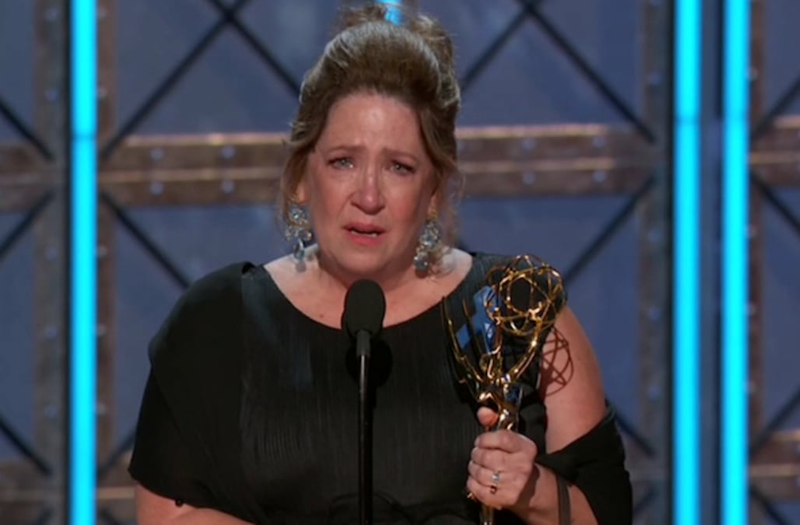 We're as shocked as she was: The Handmaid's Tale co-star Ann Dowd, who plays the imperious Aunt Lydia, scored a surprise win at the 2017 Emmys for Outstanding Supporting Actress in a Drama Series. Dowd beat out her Handmaid's Tale co-star Samira Wiley for the trophy, along with Orange Is the New Black's Uzo Aduba, Stranger Things' Millie Bobby Brown, Westworld's Thandie Newton and This Is Us' Chrissy Metz. A clearly emotional Dowd began her acceptance speech in awe: "I think this is a dream, you know? I know it's an actor's dream... I've been acting for a long time, and that this should happen now... I don't have the words, so I thank you." She went on to thank Hulu — "you're very lovely, Hulu" — and her co-star and fellow nominee Elisabeth Moss before mentioning her husband and children and offering a final, heartfelt "thank you very much." Ironically, Dowd was also nominated in the Guest Actress in a Drama category this year for her work on HBO's The Leftovers — but lost out to her Handmaid's Tale co-star Alexis Bledel.